Chores are a chore. No big revelation there. 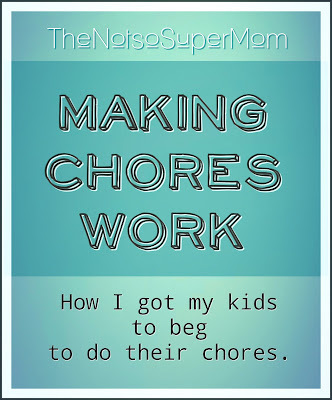 I am lazy so I have never put a lot of effort into creating chore charts or requiring my kids to do very many chores. This is partly about how things get done (folding towels in such a way that allows me to fit twice as many in the closet) and partly about me finding it easier to just do things myself rather than nag my kids and maintain a chart of when I need to nag my kids. My head would spin reading, clipping, and pinning articles about age-appropriate chores, charts, incentives and timelines for teaching, convincing, or requiring kids to pitch in. There are a lot of opposing philosophies. Some believe that it is important that kids learn to contribute to the household without expecting an allowance, others subscribe to the idea that an allowance be given freely and not tied to any manual labor. Still others say that paid chores teach children the value of hard work and the feeling of accomplishment that comes with tangible earnings. I have discovered that I fall somewhere in the middle of all of these. I wasn't on any particular mission to set up a chore system in our house. 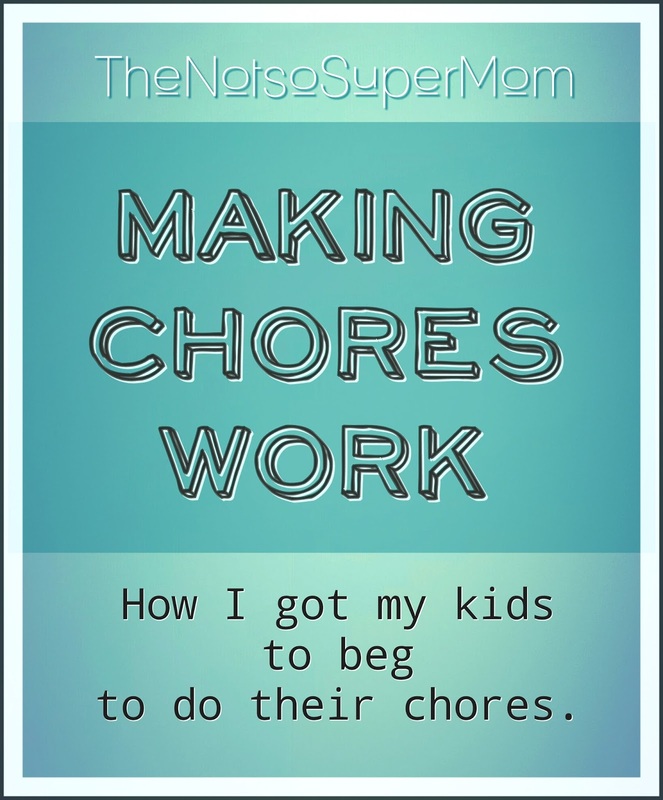 My kids are well-behaved and I have never viewed chores as punishment so they only have three ridiculously easy chores to do: set the table, empty the dishwasher and keep their rooms neat. The basic idea is that they contribute something to the household and be responsible for their own spaces. All gratis. Like a lot of you, I fold laundry at night while binge watching my DVR'd shows and fantasizing about hiring a housekeeper. For some people these tasks--these chores--are a job, their livelihood. You know, work. 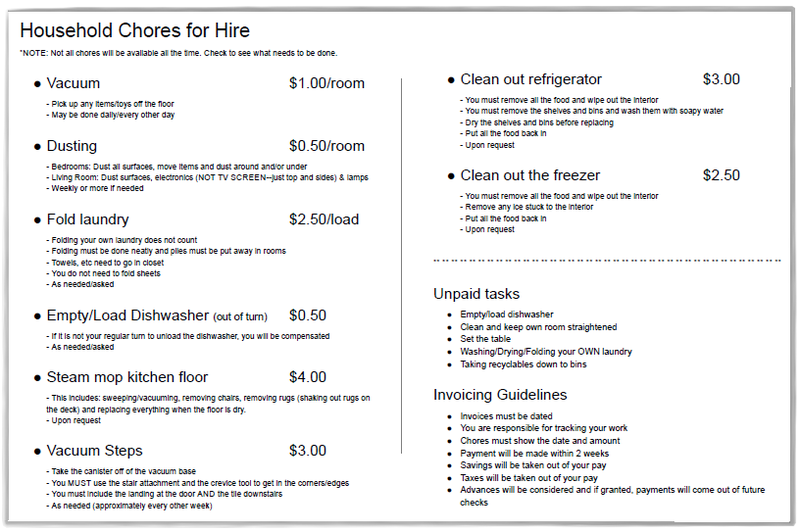 Since I can't afford to hire a full-time (or even a part-time) housekeeper, I decided to hire my kids. 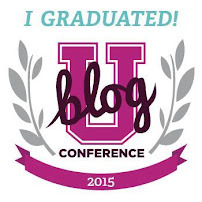 I have worked as an independent contractor in the past. I made my own hours and I was responsible for tracking my time and tasks and invoicing my clients for any billable time and expenses. I figured my 14-year-old and 11-year-old could grasp that concept and handle that level of responsibility. I bought a book of invoices from Walmart. Keeping track of the details. 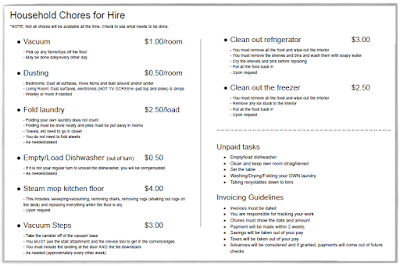 I created a list of chores and what I was willing to pay for each one. I started by deciding what I wanted to pay them per hour and assigning a price based mostly on how long the job would take, then made adjustments to account for complexity. Jobs that require more labor or more steps pay more. Simpler tasks pay less. Each job is explained in detail so that things get done properly and consistently or--since I am the boss--to my expectations. I also assigned an approximate frequency, including the idea that some tasks will be "available for hire" upon my request. As a reminder, I also listed the chores that they are expected to do, unpaid, as part of their contribution to the household. The "workers" have guidelines regarding the information they have to record and payments. I have decided to take savings and "taxes" out of their pay. The savings get transferred into their actual savings accounts and the taxes go to the local government (me and my husband). Any of these parameters can and should be adjusted as necessary. We have already made a few updates since we started. Teach them. Do not assume that your kids--even teenagers--know how to do things. I had to show them how to fold some laundry items (like those towels I mentioned) and how to properly wipe down the bathroom. Listen to your kids. Ask them what they are willing to do beyond what's on your list. You may find that they are willing to do things that you either hadn't thought of or didn't think they were capable of. Include everyone. My five year old has seen her older siblings get excited about helping out and saving for things they want to purchase. She may not understand the broader concept of this system, but it is still a fine opportunity to teach her the value of earning. And it can be practice for other skills. She can write on her own invoice and see and reap the benefits of her hard work--even if it's just a trip to the dollar store to buy herself some glow sticks. Don't be afraid to assign jobs according to who does a task better or has more experience. Of course both kids want the higher dollar jobs, but if you find that one does something better than the other, play to their strengths. Contrarily, you could encourage new skills by assigning things they don't normally take up on their own, or have them teach each other their methods. Negotiate. You might need or want to pay for a normally unpaid task. Our house is on the market and this system has been infinitely helpful in keeping the house clean during this process. I have paid extra for to get things done faster in a pinch. Require details and accountability. If they don't make a note about why I offered extra money for a task or have a quantity written on their invoice, I have questioned the amounts they charge. Follow your own rules. If you set forth that you will pay them within a certain time period, stick to it. If you are having them save a portion of their wages, show them the transfers to their savings accounts. It is another opportunity to teach them . This system has changed our household. The best indicator that it is working is how my kids have taken to it. They plan their own work and have complete control over their ability to earn what they feel they need or want. They have set goals for themselves and they feel accomplished while measuring their own progress and working toward those goals. Our kids have a much healthier respect for our work and our earnings. I am happy that they are getting a glimpse of how the working world works and comprehending things on a much wider scale beyond the scope of their relatively narrow teenage existences. I pointed out the them that now that school is in session, they may find it more difficult to earn without long summer days to fill. They see that as a challenge. That's fine with me because I see that as a WIN for all of us. Genius! I love this, Melanie :) Well done! Thank you, Meredith! They really have taken to it! And my house looks great! Great idea! Thanks for the tips! I love this! 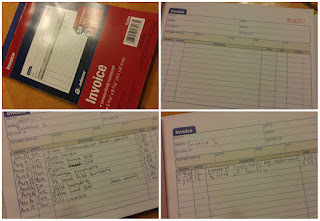 On the few occassions I am willing to pay them for stuff I always struggle to keep track. The invoices are a great idea. Mine have more unpaid chores that are going to stay unpaid because i can't afford to pay them all to pick up the living room and take out the trash and such every day. That is the great thing about this. YOU can control the big picture--what is important for them to do to contribute to the household and what you are willing to pay to get done an /or keep up; THEY control how and how much they want to earn. My kids now even tell me when they plan on doing what next, so I have an idea of what I still need to keep on top of, etc. 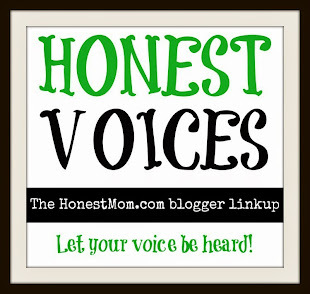 This has been such a great thing for our household, I hope it works as well in yours! Keep me posted!